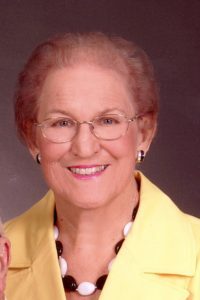 Pine Level – Martha Octavia Howell Jones, age 83, died Wednesday evening, February 7, 2018 in SECU Hospice House in Smithfield. Born August 16, 1934 in Wayne County she was a daughter of the late William and Stella Williams Howell. She was preceded in death by all of her siblings. Martha was a member of Pine Level Free Will Baptist Church. Funeral services will be conducted at 2:00 p.m. Sunday, February 11, 2018 in the chapel of Parrish Funeral Home with Rev. Howard Scott and Rev. Al Warrick officiating. Burial will follow in Price Cemetery. The family will receive friends from 1:00 – 2:00 p.m. Sunday just prior to the service. Surviving are her husband of 63 years, Rudolph Jones of Pine Level; sons, Randy Jones of Princeton and Mark Jones of Raleigh; daughters, Vicky Martin and husband Gregg of Pine Level, and Wanda Blow and husband Gordon of Smithfield; grandchildren, Emily Byrd, Lindsay Marrow, Justin Byrd, and Jeremy Barbour; and great grandchildren, Madison Barbour and Weston Barbour. Flowers are appreciated or memorial contributions may be sent to the SECU Hospice House, Johnston Health Foundation, P.O. Box 1376, Smithfield, NC 27577.